Once per turn, Sun Lu Ban can discard one hand card and select any damaged male. The target recovers one health then Sun Lu Ban takes a card from the male. Sun Lu Ban can give any number of attacks to any number of people. Anyone that was given an attack cannot attack or duel Sun Lu Ban until her next turn. 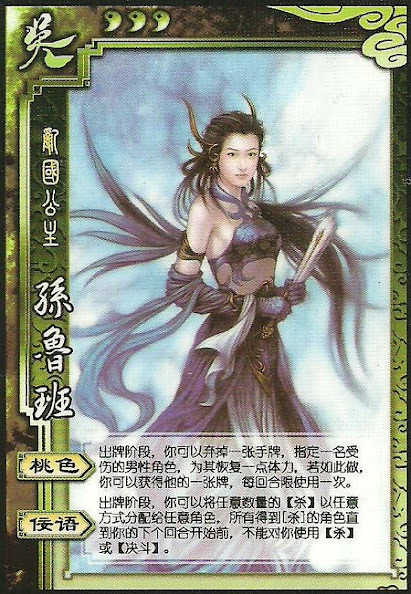 Sun Lu Ban can only use "Seduce" on a male that has taken damage and has at least one card. "Seduce" can be used to take either hand cards or pieces of equipment. Sun Lu Ban has no restrictions for giving away Attacks. She cannot give any other cards away however.